Ph.D., Northeastern University, Boston, USA. Chowdhury, A. H., and Arefin, K. M., “Modelling Co-movement of different Sectors in Dhaka Stock Exchange (DSE) using Asymmetric BVAR-GRACH Models,” Journal of Finance and Economics, 5(3), 105-117, SciEP, 2017, USA. Chowdhury, A. H., and Kabir, R., “Trend Adjusted Exponential Smoothing Forecast: Evidence from a Multinational Company in Bangladesh,” Accepted, Journal of Business Administration. Rahman, M. S., Osmangani, A. M., Daud, N. M., Chowdhury, A. H., and Hasan, H., “Trust and Work Place Spirituality on Knowledge Sharing Behaviour: Perspective from Non-acdemic Staff of Higher Learning Institutions,” The Learning Organization, vol 22, no 6, Emerald, 2015, UK. Sultana, I., Ahmed, I., Chowdhury, A. H., and Paul, S. K. “Economic design of x-bar control chart using Genetic Algorithm and Simulated Annealing Algorithm,” International Journal of Productivity and Quality Management, vol. 14, no. 3, 352-372, Inderscience, 2014, USA. Wali, F I, Md, Chowdhury, A. H., Alam, K, Md. S., Wali, Md. M. I., Islam, M., “Collaborative Education: New Frontier for Furure Education and Yunus Social Business.” Business Education and Accreditation, 6(1), 101-110, 2014, USA. Chowdhury, A. H., and Hossain, M. S. “(Book Review), Building Social Business- The New Kind of Capitalism That Serves Humanity’s Most Pressing Needs-by Muhammad Yunus (2010)-Published by Public Affairs, Percus Books Group, USA” Jahangirnagar University Journal of Marketing, vol 2, 105-108, 2014, Bangladesh. Chowdhury, A. H., and Islam, R. “Trade Liberation and De Novo Hypothesis in the Context of Bangladesh: A Conintegration Analysis.” International Journal of Trade and Economic Development,. Academy of Business and Retail Management (ABRM), 1(1), 94-106, 2013, UK. Islam, R., Chowdhury, A. H., and Islam, M. T. “Testing for Global Volatility Spillover, Financial Contagion and Structural Break in 15 Economies from Two Regions: A Diagonal VECH matrix and EGARCH (1,1) Approach.” International Journal of Economics and Finance, 5(5), 159-170, 2013, Canada. Das, K., and Chowdhury, A. H., “Designing a reverse logistic network for optimal collection, recovery and quality-based product-mix planning,” International Journal of Production Economics, 135, 209–221, Elsevier, 2012, USA. Hussain, M.., Chowdhury, A. H., and Hussain, B., “Sweets and Sours of Social Business: A Case study on Grameen Danone Foods Ltd.,” World Journal of Social Sciences, 2, 256–266, 2012, Australia. Miah, Khasro M, and Chowdhury, A. H., “The Transfer of Japanese Human Resources Management Practices in South Asia: Contingencies, Constraints and Competencies.” Proceedings of 11th South Asian Management Fotum (SAMF), 44-45, 2011, Nepal. Sharif U. M., Chowdhury, A. H. and Malek, A. M., “An Alogorithmic Approach to Minimize Transportation Cost,” North South Busniess Review, 3 & 4, 72-79, 2009-2010, Bangladesh. Chowdhury, A. H., Twarique, Md. Iqbal, and Miah, Md. Khasro, “A Study of Service Quality Determinants of Private Universities in Bangladesh using SERVQUAL,” Journal of Knowledge Globalization, v.3, no. 1, 49–74, 2010, USA. Shareef, M. A., Kumar, V., Kumar, U., Chowdhury, A. H. and Misra, S. C., “E-Government Implementation Perspective: Setting Objective and Strategy.” International Journal of Electronic Government Research, vol. 6(1), 59-77, 2010, UK. Chowdhury, A. H. and Rahman, Z. R., “Application of Line Balancing Method for Process Improvement: The Case of a Bank in Bangladesh,” South Asian Journal of Management, vol. 17(2), 137-159, 2010, India. Ahmed, S. F. and Chowdhury, A. H., “Determinants of Firm-Customer Relationship Quality: An Empirical Investigation using SEM Technique,” East West Journal of Business and Social Studies, vol.1, 25-47, 2010, Bangladesh. Merry, Mst. Fatema Akter and Chowdhury, A. H., “On the Application of Fuzzy Time Series Forescasting on Demand Sales,” Proceedings of the International Conference on Knowledge Globalization, 85-90, 2010, Bangladesh. Bashir, M M A; Khalil, Z T; Haider, ASM S; Chowdhury, A. H. and Mustafa, M S, “Social Business: Scopes and Challenges,” Proceedings of the International Conference on Knowledge Globalization, 178–180, 2010, Bangladesh. Bashir, A. and Chowdhury, A. H., “Quality Initiatives: A Look at Process Improvement Models and Applications,” Proceedings of the International Conference on Knowledge Globalization, 390-397, 2010, Bangladesh. Chowdhury, A. H. and Rahman, M. H. “Adaptive Response Rate Exponential Smoothing Forecast in Analyzing IBM’s Revenue,” The Business Review, v.1, 1-11, 2009, Bangladesh. Chowdhury, A. H. and Ferdous, A. S., and “Antecedents of Firm-Customer Relationship Quality: The Bangladesh Evidence,” Proceedings of the 10th South Asian Management Forum (SAMF), 251–260, 2009, Bhutan. Chowdhury, A. H., “Recent Development in Analyzing Censored Data from Highly Fractionated Experiments,” Proceedings of the International Conference on Statistical Sciences (ICSS), 43 -50, 2008, Bangladesh. Bashir, A, and Chowdhury, A. H., “ANN Based Forecasting of Electricity Demand: A Comparison with Traditional Forecasting Techniques,” Proceedings of the International Conference on Statistical Sciences (ICSS), 362-365, 2008, Bangladesh. Hossain, M. Z., Ferdous, A. S, and Chowdhury, A. H., “Economic Significance of Gambling: Does Gambling Influence Rent?” Proceedings of the International Conference on Statistical Sciences (ICSS), 283-289, 2008, Bangladesh. Miah, K. M., Chowdhury, A. H., and Iqbal, Md. T., “Higher Education Quality for Development of Bangladesh: An Application of Factor Analysis,” Proceedings of the 12th National Annual Quality Convention. BSTQM, 18-30, 2008, Bangladesh. Chowdhury, A. H. and Aggarwala, R., “Imputation of Censored Response Data in a Bi-variate Designed Experiment,” Journal of Quality Engineering, Taylor & Francis, 19, 67-75, 2007, USA. Chowdhury, A. H. and Fard, N., “Design of Experiments for Incomplete Life Data,” North South Business Review, vol. 2, no.1, 54-61, 2007, Bangladesh. Chowdhury, A. H., Doerksen M. and Eesbeek M. V., “Factors Affecting the Rate of Obesity: An Application of Regression Analysis and Simulation Modeling,” Social Science Review, vol. 21, no.1, 125-140, 2007, Bangladesh. Chowdhury, A. H., Md. Tawrique and Miah, Khasro M, “An Empirical Analysis of Perceived and Expected Service Quality: A Case Study on Private Universities of Bangladesh,” Proceedings of the 11th International Convention on Quality Improvement. PIQC, 1-19, 2007, Pakistan. Chowdhury, A. H., “Product Quality Improvement via Robust Design of Experiments,” Proceedings of the 9th South Asian Management Forum, 476-484, 2007, Bangladesh. Chowdhury, A. H. and Doerksen M., “Identification of Forecasting Method for Time Series Data with Trend and Seasonality,” North South Business Review, 1(1), 32-56, 2006, Bangladesh. Chowdhury, A. H. and Fard, N. “Design of Experiments in Life Data Analysis with Censored Data,” Proceedings of the 10th International Convention on Quality Improvement. PIQC, 2-15, 2006, Pakistan. Chowdhury, A. H. and Aggarwala, R., “Identification of Censored Response Data in a Multivariate Experiment,” Pakistan Journal of Statistics, v. 21(2), 147 -158, 2005, Pakistan. Fard, N. and Chowdhury, A. H., “Robust Design of Experiments in Lifetime Data Analysis with Missing Observations,” International Journal of Industrial Engineering, 11(4), 339 - 348, 2004, (ISSN 1072-4761), USA. Chowdhury, A. H. and Fard, N., “Design and Analysis of Left Censored Data from Highly Fractionated Experiments,” Pakistan Journal of Statistics, v. 20(1), 159 - 171, 2004, Pakistan. Chowdhury, A. H., “On the Application of Boolean Function in Designed Experiments with Censored Response Data,” Journal of Statistical Studies, v.23, 79 - 81, 2003, Bangladesh. Chowdhury, A. H., “First Differential Auto Regressive Model for Sales Forecast of an American High-Tech Company,” Journal of Business Administration, 28(3&4), 59–72, 2002, Bangladesh. Chowdhury, A. H. and Fard, N., “Analysis of Interval Censored Data from Highly Fractionated Experiments,” International Journal of Industrial Engineering, 8(3), 241-250, 2001, ISSN 1072-4761, USA. Chowdhury, A. H. and Fard, N., “Estimation of Dispersion Effects from Robust Design Experiments with Censored Response Data,” Journal of Quality and Reliability Engineering International, v.17, 25 – 32, 2001, John Wiley, USA. Fard, N. and Chowdhury, A. H., “Design and Analysis of Experiments for Unbalanced Data,” Proceedings of IV SIMPOI/POMS, August 11 – 14, 2001, Brazil. Chowdhury, A. H. and Fard, N., “Determination of Censored Response Data for a 2k-p Fractional Factorial Experiment,” Journal of Quality Engineering, 13(2), 261–267, 2000, Marcel Dekker, USA. Fard, N. and Chowdhury, A. H., “Statistical Analysis of Incomplete Life Data,” Proceedings of the 9th Annual Industrial Engineering Research Conference, Track 4, 1–6, May, 2000, USA. Chowdhury, A. H. and Fard, N., “Decision Rules for Censored Response Data in a Factorial Experiment,” Proceedings of the 5th ISSAT International Conference on Reliability and Quality in Design, 408–412, August, 1999, USA. Fard, N. and Chowdhury, A. H., “Design and Analysis of Experiments Involving Censored Failure Data,” Proceedings of the International Conference on Integrity, Reliability, and Failure, Section 2-C, 89, July, 1999, Portugal. Fard, N. and Chowdhury, A. H., “Analysis of Censored Data for Highly Fractionated Experiments in Reliability Improvement,” Proceedings of the 4th Iranian International Statistics Conference, August 23 - 25, 1998, Iran. Chowdhury, A. H., “Prediction of Component Failure Data using Statistical Forecasting Techniques,” Journal of Islamic University Studies, Part-C, v. 1 (2), 35 – 49, 1998, Bangladesh. Chowdhury, A. H., “Staff Scheduling Decision Making: An application of Winter’s Model,” Journal of Statistical Studies, v. 17, 29 - 38, 1997, Bangladesh. Chowdhury, A. H., “Exponential Smoothing Model in Analyzing the Quarterly Net Sales of an American Corporation,” Journal of Statistical Studies, v. 15, 42 - 51, 1995, Bangladesh. Chowdhury, A. H., “Analysis of Censored Life Test Data and Robust Design Method for Reliability Improvement from Highly Fractionated Experiments.” Unpublished Ph.D. Thesis, Northeastern University, 1999, USA. Chowdhury, A. H., “Socioeconomic Condition of S.S.C. Passed Student and Factors Affecting their Attitude towards Higher Education - A Case Study.” Unpublished Master’s Research, Jahangirnagar University, 1987, Bangladesh. Chowdhury, A. H. and Aggarwala, R., “Modeling Censored Data in Designed Experiments with Replicated Responses,” Journal of Applied Statistics, USA. Chowdhury, A. H., Mohiuddin M. and Kamrul, M, “Service Quality GAP: A Case Study on different physiotherapy centers in Dhaka City.” In Preparation. Chowdhury, A. H., Sensitivity Analysis of a Simulation Model using Fractional Factorial Experimental Design,” In preparation, Journal of Statistical Studies, Bangladesh. Chowdhury, A. H., “On some Statistical Hypothesis Tests for Selecting Best Supplier.” In preparation. Chowdhury, A. H., Islam R, and Ridwan, S. M., “Study of Stock Indices Predictibility Using Monte Carlo Simulation.” In preparation. National Science Foundation Travel Grant, (Grant # 0207059) National Institute of Standards and Technology, Maryland, USA, 2002. Natural Science and Engineering Research Council (NSERC) of Canada, Partial grant for post-doctoral research, University of Calgary, Canada, 2001. Industrial research grant for post-doctoral research provided by Nortel Networks, (with Prof. R. Aggarwala), University of Calgary, Canada, 2001. Post-Doctoral Research Fellowship, Pacific Institute for the Mathematical Sciences, University of Calgary, Canada, 2001. Teaching Assistantship, Graduate School of Engineering, Northeastern Univ., 1996-1999. Research Assistantship, Department of Mechanical, Industrial and Manufacturing Engineering, Northeastern University, Summer, 1998, 1999. Conference Award, Graduate & Professional Student Asso., Northeastern U., Summer, 1999. Research Award, Graduate & Professional Student Asso., Northeastern Univ., Spring, 1999. NUTA Assistantship, Grad. School of Engineering, Northeastern University, 1994-1995. NUTA Assistantship, College of Arts & Sciences, Northeastern University, Spring, 1993. D.P.I. (Govt.) Scholarship, B.Sc (Honors) and M.Sc. result, Bangladesh, 1984-1985. Jahangirnagar University Merit Grant, Jahangirnagar University, 1982-1984. 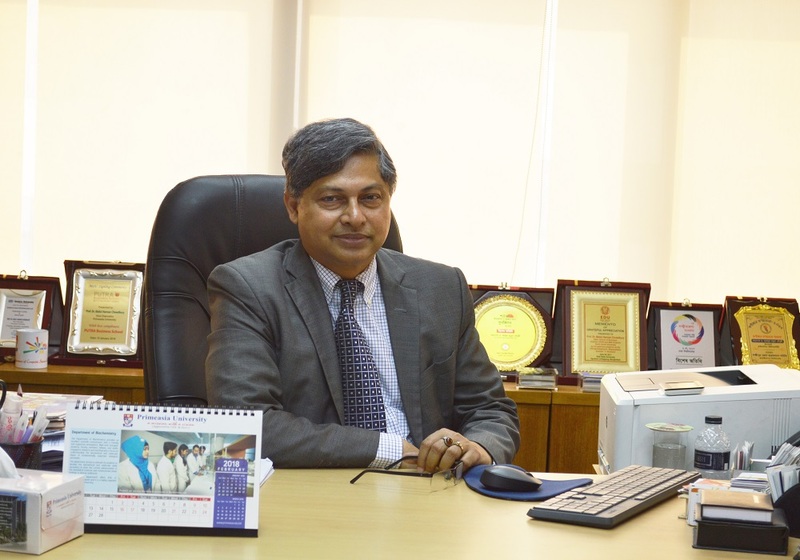 April 2017 - Present: Vice Chancellor, Primeasia University, Banani, Dhaka, Bangladesh. Formulating policies and implementing strategies for the university. Heading different committees formed by the of Private University ACT 2010 of Ministry of Education, Government of Bangladesh, University Grants Commission (UGC) Rules, and PAU Board of Trustrees (BOT). Overseeing Institutional Quality Assurance Cell (IQAC) projects. Serving as the chair of the syndicate, academic council, administrative, staff/ faculty selection committees and member of BOT. Representing University in different national and international platforms. May 2014- April’ 17: Pro Vice Chancellor, Eastern University, Dhamondi, Dhaka, Bangladesh. Formulating strategic plan, heading different committees assigned by the vice chancellor, oversee office of the student affairs, proctorial body, library, admission office, career services and international office, providing career placement guidelines, taking initiatives for overall education quality improvement, policy and strategies for admissions office, guiding resources improvement of the library, ensuring quality in research, teaching and publications, taking initiatives for image building, and assisting vice chancellor in any assigned task. Team Leader of One Asia Foundation funded course, Serving as the member of the syndicate, academic council, administrative, staff/ faculty selection committees and invited Member of BOT. Representing University in different national and international platforms. Company/Institute Name: Faculty of Business Administration, Eastern University, Bangladesh. Sept’16-May’17: Dean (Acting), Faculty of Business Administration, Eastern University, Bangladesh. Responsibilities: Overall supervision and efficient functioning of the school, supervising BBA, MBA, & EMBA program directors & departmental heads, monitoring and mentoring fifty fulltime/ part time faculty members; recruiting fulltime/ part time faculty members. January 2014 - May 2014: Executive Director, External Relations, North South University, Bangladesh (This position was ranked above all Deans to directly report to the VC, NSU). Responsibilities: Taking initiatives to outreach foreign universities, international bodies, responsible for international matters including MOUs, international students and visitors, initiatives to formulate and implement a strategic plan and develop an assessment plan for the external office, and outreach to the corporate world, public and private organizations to promote university’s interests globally. May ’10-October’13: Dean, School of Business, North South University, Dhaka, Bangladesh. Responsibilities: Overall supervision and efficient functioning of the school, supervising BBA, MBA, & EMBA program directors & departmental heads, monitoring and mentoring more than hundred fifty fulltime/ part time faculty members; recruiting fulltime/ part time faculty members, supervising staffs; offering more than hundred courses (approx. 450 sections) in each semester, assigning courses, monitoring classes, organizing faculty search seminars, liaisoning top executives of the university, organizing professional trainings and workshops, assessing needs for the school, publishing brochure, editing and reviewing paper for the business school journal, promoting research facilities, guiding and advising over ten thousand students of the program. October ‘07-June 2012: Director, BBA Program, School of Business, North South University, Dhaka. Responsibilities: Overall supervision and efficient functioning of the program, mentoring students of the program, directing associate Directors, supervising more than sixty fulltime and twenty part time faculty members; recruiting fulltime/ part time faculty members, supervising staffs of the program; offering more than fifty courses (approx. 250 sections) for each semester, assigning courses, monitoring classes, organizing faculty search seminars, maintaining liaison with top executives of the university, organizing professional training and workshops, assessing needs for the school of business, publishing brochure, editing and reviewing paper for the business school journal, promoting research facilities, guiding and advising over six thousand students of the program. Developing curriculum and evaluating program and committee services. October 2005- March 2012: Director, Department of Career and Professional Development Services, (CPDS), North South University, Bangladesh. Responsibilities: Overall supervision of CPDS and efficient functioning of the department, providing internship and job placement of the students; holding training, workshops and seminars, organizing conferences, maintaining vital contact with top corporates of the country; organizing professional training for faculty/ staff, workshops for corporates and updating alumni profile. Organizing national career fair and fund raising. April ‘08- May ‘14: Professor, School of Business, North South University, Dhaka, Bangladesh. Taught business statistics, operations management, Total quality management and quantitative methods classes in both the MBA and EMBA programs. Supervising under graduate and graduate intern students. Conducting researches on Product/process quality and reliability Improvement, Service Quality, Forecasting, Operations Management, TQM and Social Business. May ‘05- March ‘08: Associate Professor, School of Business, North South University, Bangladesh. Taught business statistics, operations management, Total quality management and quantitative methods classes in both the MBA and EMBA programs. Taught introduction to statistics class in the BBA program. Supervised under graduate and graduate intern students. September 2002- April 2005: Assistant Professor, Dept. of Mathematics & Statistics, Univ. of Windsor, Canada. Taught statistics for the sciences course to the undergraduate classes. September 2001- September 2002: Post-Doctoral Research Fellow, The Pacific Institute for the Mathematical Sciences (PIMS), Dept. of Mathematics and Statistics, University of Calgary, Alberta, Canada. Conducted research on industrial experiments with censored response data under financial support of the PIMS, Nortel Networks, Natural Sciences and Engineering Research Council (NSERC), and the StatCAR lab of the University of Calgary. September 1999- September 2001: Lecturer of Quantitative Methods, Department of Management Sciences, College of Business Administration, Northeastern University, USA Taught Business Statistics, Operations Management and Service Operations Management courses. Summer 2000: Lecturer, (Part-time), Dept. of Mechanical, Industrial and Manufacturing Engineering (MIME), College of Engineering, Northeastern University, USA Taught undergraduate Probability Analysis for Engineers course. September 1993- September, 1999: Teaching/Research Assistant, Dept. of MIME, Northeastern University, USA Taught “Probabilistic Analysis for Engineers,” Winter, ‘97, “Statistics,” Fall, ‘97, “Engineering Statistics,” Spring, ’98, “Probability & Statistics,” Summer, ’98, “Statistics,” Winter, ’99 courses. Assisted graduate level courses (Design of Experiments, Statistical Quality Control, Applied Statistics, Basic Probability, Engineering Economics, Reliability Analysis and Testing). Demonstrated Turbo SPC/SQC and other statistical software to the graduate/undergraduate students. April 1994- October 1994: Software Editor, Addison-Wesley Publishing Co., Boston, MA, USA. Edited three Mathematics books written by Keedy/Bittigner (Intermediate Algebra, Basic Mathematics and Introductory Algebra) to develop the solution of the problem using FUTURA Authoring Tool Software. Summer 1993: Data Analyst, Chadwick Martin Bailey, Inc., Boston, MA, USA. Worked on “Massport Air Passenger Study,” project. Responsibilities: Data Collection, Data Coding, Editing and Evaluation of Questionnaire. October 1988 - November 1992: Lecturer of Statistics, Department of Management, Islamic University, Bangladesh Taught undergraduate Introductory Statistics, Business Statistics, Mathematical Statistics, Probability, Economics & Graduate Managerial Mathematics courses. September 1989 - February 1990: Lecturer, (part-time), Department of Economics, Islamic University, Bangladesh Taught undergraduate Mathematical and Economic Statistics courses. November 1990- May 1992: Lecturer, (part-time), Department of Statistics, Tejgaon College, Dhaka. Taught business statistics courses while fulltime at the Islamic University. October 1988- September 1989: Lecturer, (part-time), Department of Statistics, Dhaka City College, Dhaka. Taught undergraduate business and inferential statistics courses while working as fulltime at the Islamic University. July 1988- October 1988: Lecturer, Department of Statistics, Dhaka City College, Dhaka. Taught undergraduate business and inferential statistics courses. March ’88– July ‘88: Research Assistant, Development Researchers and Associates (DRA), Dhaka, Bangladesh. Worked on the project titled “Increasing contraceptive prevalence rate in Lakshmipur project.” Responsibilities: Data analysis, questionnaire coding, project evaluation, and report writing. Jan ’88-March ‘88: Research Assistant/ Editor, Society for Project Implementation Research Evaluation & Training (SOPIRET), Dhaka, Bangladesh. Worked on the project titled “Intervention and its impact on health and family planning- A base-line survey.” Responsibilities: Data collection, analysis, coding, and report writing. Advisory Member, Mohosin Memoral Foundation, Social organization, Laxmipur, 2006-2007. Advisor, BITAN, An NGO for empowering unprivileged women through technology, 2001. Head, Fund Raising Sub Committee, NSU Computer Programming Contest, NSUCPC, 2007. Co-oordinator, Tribute to NSU Banani Campus. Organized by all clubs of NSU, May, 2009. Organized more than hundred professional seminars, workshops at North South University under the aegis of the Department of Career and Professional Development Services, 2006-2011. Advisory Panel Member, GEN-N, A prominent lifestyle magazine for youth, Bangladesh, 2008-09. Advisor, Learner’s Association, A student organization that aid’s students, Laxmipur, 2008-09. Faculty Advisor, NSU MBA Club, Working as advisor of the graduate club of NSU, 2008-2011. Organized six international conferences at NSU under the aegis of CPDS, 2006 - 2014. Member, Executive Committee, ACM Intl. Collegiate Programming Contest (ICPC), 2008-2009. Chief Advisor, South Asian Youth Society (SAYS), “Knowledge for Change Program” Youth Leadership program supported by US Embassy, 2011. Co-chair, Executive Committee, ACM International Collegiate Programming Contest (ICPC), 2011. Member, Judges Panel, Grandmaster- an idea Contest, Organized by Banglalink, 2011-2013. Member, International Advisory Committee, First GSBS Research Conference on Social Business, Organized by GCL Germany and Universiti Kebangsan Malaysia (UKM), Malaysia, Nov, 5-6, 2013. Member, Panel of Experts for Assessment and Selection Committee, Professor and Associate Professor Position, Department of Commerce, University of Karachi, Karachi, Pakistan, 2014. Member, South Asian Social Enterprise Assessment Team, British Council, Bangladesh, May 2014. Patron, Social Business Youth Convention 2014, Theme: Empowering Youth through Social Business, Organized by Eastern University, July 2, 2014. Member, Scientific Committee, Second GSBS Research Conference on Social Business, Organized by GCL Germany and Glasgow Caledonian University (UK), Mexico, November 25-26, 2014. Chief Advisor, Youth Initiative Promotion Foundation, www.yipfoundation.org, 2014. Member, Scientific Committee, GSBS Academia Conference 2015, Organized by GCL Germany, Berlin, Germany, November 3-4, 2015. Member, Planning and Organizing Committee, GSBS Academia Conference 2015, Berlin, Germany, November 3-4, 2015. Member, Brochure Sub-Committee, “World Statistics Day 2015,” Bangladesh Buearu of Statistics, Ministry of Planning, Govt. of Bangladesh, 2015. Member, National Organizing Committee for Observing “World Statistics Day 2015,” Bangladesh Buearu of Statistics, Ministry of Planning, Govt. of Bangladesh, 2015.